Also called the black-handed spider monkey, Geoffroy's spider monkey is found in Central America in the countries of Mexico, Belize, Costa Rica, El Salvador, Guatemala, Honduras, Nicaragua, and Panama. Adults reach about 15 to 25 inches in length and weigh about 17 lb. They are called spider monkeys because of their extremely long, spidery limbs and prehensile tail, which acts as a fifth arm and is used for feeding and picking things up and moving around the forest. They are often seen hanging in trees by one limb or by the tail. They are excellent tree climbers and have been known to leap over 30 feet between trees and branches, and they are also able to walk bipedal along tree branches. Coat colors vary according to subspecies and range from light brown to black, and as their alternate name suggests, their hands and feet are black. Their faces are hairless, with un-pigmented skin around the eyes and muzzle. Spider monkeys are found on the coasts of lowland rain- and mountain forests. They are only active in the day and rarely come down to the ground. 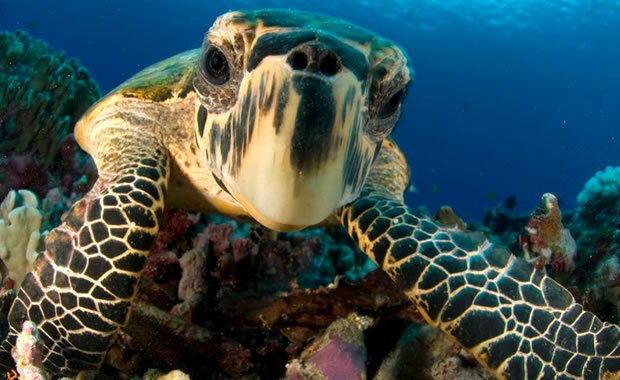 They are very social animals and tend to live in groups of 4 to 35. (Some groups of up to 100 have been observed.) When ready to forage they tend to split up into smaller groups. Diet consists of fruit, leaves, flowers, and occasionally bark, nuts, seeds, insects, spiders, and eggs. Breeding occurs year round, and the females are very picky about who they will mate with. Only a single infant is born after a gestation period of seven to eight months. When young females mature, they tend to leave their family group to join another. 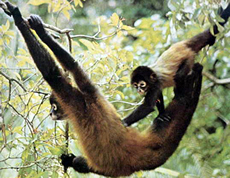 There are 16 Geoffroy's spider monkey subspecies, and two are threatened with extinction: the Black-foreheaded spider monkey (Ateles geoffroyi frontatus), found in Costa Rica and Nicaragua, and the Panamanian red spider monkey (Ateles geoffroyi panamensis) found in Panama and Costa Rica. Both suffer from habitat loss due to logging, and some are hunted for food by locals since they live in large groups and are very noisy, making them easy to find. The black-foreheaded spider monkey is protected in one national park and two reserves, and The Panamanian red spider monkey occurs in a national park in Costa Rica and one biological reserve. Copyright Notice: This article is licensed under the GNU Free Documentation License. It uses material from the Wikipedia article "Geoffroy's spider monkey". Glenn, C. R. 2006. "Earth's Endangered Creatures - Geoffroy's Spider Monkey Facts" (Online). Accessed 4/19/2019 at http://earthsendangered.com/profile.asp?sp=283&ID=5. Need more Geoffroy's Spider Monkey facts?